Despite being recognized for many years, needle stick and sharps injuries (NSSIs) con-tinue to present a risk of occupational exposure to blood-borne pathogens for health care works (HCWs). This study was conducted to investigate the epidemiological characteristics of needle stick and sharps injuries (NSSIs) among healthcare workers (HCWs), their follow-up and immunization status for hepatitis B virus (HBV) among injured workers in a terti-ary teaching hospital in Saudi Arabia. It was a retrospective survey of all self-reported documents related to NSSIs, during the period of 5 years from 2001 to 2005. This study included 133 HCWs who reported NSSIs, nurses (45%) sustained the highest number of injuries followed by physician (26%). The majority of injuries occurred dur-ing the procedures. Analysis of the source of injuries revealed that known sources ac-counted for 97 injuries and unknown sources accounted for 36 injuries, most of them from garbage bags and devices left inappropriately. For injuries from known sources, 14,15 and 1 were positive for Hepatitis B surface antigen (HBsAg), antibody to hepatitis C virus (anti-HCV), antibody to human immunodeficiency virus (anti-HIV), respec-tively. No seroconvention to HBV, HCV or HIV infection was observed among followed-up HCWs. This data emphasized the importance of selected training and education programs for specific practicing according to the nature and area of work should be directed to each specific group of HCWs for prevention of NSSIs, in addition to have effective sero- protection against HBV through vaccination. In Saudi Arabia, Hepatitis B used to pose a threat to HCWs due to its high endemic rate between 5 and 10% among the native population and the prevalence varying from one region to another [7,8,9]. After addition of Hepatitis B vaccine to the Extended Program of Immunization (EPI) in 1989, there was a significant reduction in the prevalence rate to become between 0.3% among children in 1997  and 1.5% among blood donors in 2002  Whereas, the prevalence of hepatitis C virus (HCV) is still significantly high with a rate of 1.1% . Active surveillance and periodic review of interventions are important aspects to reduce NSSIs in targeted highrisk occupational groups, especially when the workforce has a high turnover, as in academic health centers like our hospital. This study presents the results of the 5 years of a surveillance program involving follow-up of HCWs exposed to blood-borne viruses. The purposes of this study were to analyze self-reported cases of NSSIs in HCWs, to determine the immunization status for HBV and seroprevalence of HBV, HCV, and HIV among injured HCWs in a tertiary teaching hospital. The rate of reporting as well as the nature and circumstances under which they	occurred, were explored. Determinants of such injuries are important to investigate and to design effective prevention program. A retrospective review of the infection control department records of NSSIs between 2001 to 2005 was conducted at King Khalid University Hospital (KKUH), Riyadh, Saudi Arabia. KKUH is an 800-bed university teaching hospital with a nursing staff of 1315, around 640 medical staff and 32 housekeepers. All employees are screened on initial hire by the Employee Health Clinic (EHC) to determine a baseline status for each blood-borne pathogen, HBV, HCV, and HIV. When non-immunity to HBV is documented, the employee is advised to obtain the hepatitis B vaccine series.This is provided free to all hospital employees in the hospital. Hospital policies required every sharp injury or body fluid exposure to be documented on an incident and report form (IRF) and reported to the EHC at the time of injury during normal working hours or to the emergency room after hours or during weekend. The standard IRF included the following contents: a series of checked boxes on demographic and a detailed written location and description of the event completed by injured HCW, in addition to a section for comments by the area supervisor. These data were collected and analysed manually. We excluded body fluid exposure as they pose a low or nil risk of blood-borne virus transmission. Staff have been grouped into four groups of doctors and nursing staff, those at risk of “downstream” injury (housekeeper, catering, wardsmen, laundry and Central Sterilizing Supply Department (CSSD); and other staff (phlebotomists, paramedical and laboratory). Serological tests for injured HCWs and source patients after his/her consent were carried out. The employee was counseled and chemoprophylaxis was given when indi-cated. Follow-up anti-HCV tests and ALT activity for HCWs exposed to known HCV source were conducted at 4-6 months. For the last 2 years, RNA testing was done at 6 weeks in order to diagnose HCV infection earlier for proper management . Tests for anti-HIV were con-ducted at 6 and 12 weeks, and 6 and 12 months for HCWs exposed to HIV. Although follow-up tests were not performed for HCWs who were serologically susceptible to HBV, they were offered post-exposure program. At our institute, a total of 133 of NSSIs were reported to the Infection Control Department during the 5 years (2001-2005). The overall distribution of NSSIs by HCWs’ occupational categories is shown in Table 1. Most reported NSSIs involved nursing staff (45.1%), followed by doctors (26.3%), then downstream staff (24.8%). Table 1: Distribution of reported NSSIs by year of exposure and Job categories. Demographic information is presented in Table-2. More than sixty percent of the reported injuries involved female employees (mostly nurses). The largest number of injured HCWs (34.6%) was in the 20-29-year-old age group. The emergency room (ER) as well as the Medical wards re-corded 27 employees with NSSIs (20.3%) for each of them, accounting for the highest proportion NSSIs of the total. This was followed by the operating theaters with 19 cases of NSSIs (14.3%), then the surgical wards with 15 cases (11.3%). Looking at circumstances associated with NSSIs in HCWs for the entire survey period (Table-3) illustrated that more than 55% of injured HCWs were in the process of using a device. The majority of which were due to blood collection (21.8%) followed by surgical pro-cedure (14.3%). However, 31.6% of NSSIs in our institu-tion was associated with disposal-related activity in which devices were left in inappropriate containers (14.3%) or were left in inappropriate places after use (10.5%) or during disposal (6.8%). Table 2: Characteristics of the 133 Health care workers(HCWs). Table 3: Circumstances associated with NSSIs. Analysis of the source of injuries revealed that unknown source accounted for 36 injuries. 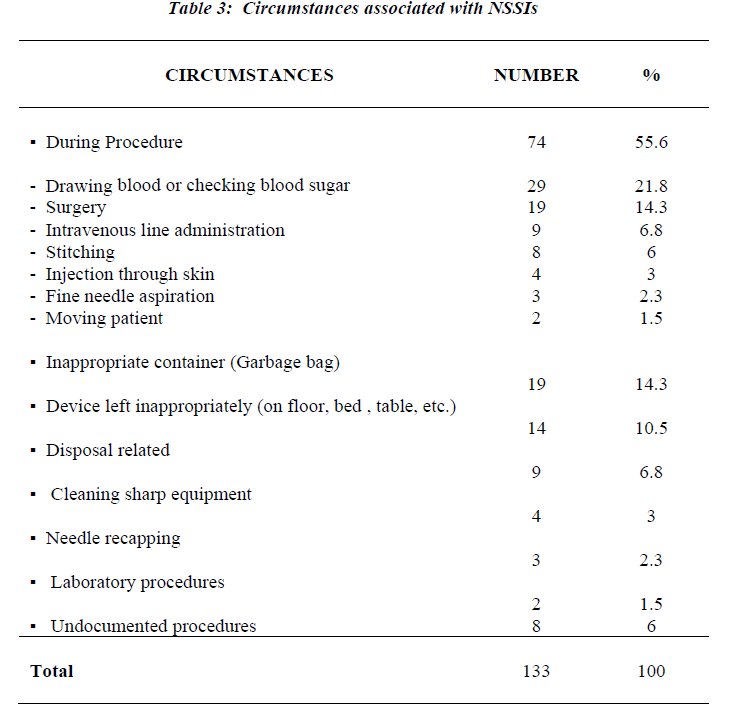 As shown in Table-4, the majority of which were due to sharps protruding from inappropriate containers such as garbage bags (52.8%) followed by devices left in inappropriate places after use 36.1%). Of concern, 25 of 36 unknown source injuries occurred in housekeepers. Table 4: Unknown source by job Classification and procedure being performed. The serological data for injured HCWs and source patients are displayed in Table-5. In the present study, for 133 injured HCWs, the source identity could be established in 97 cases. Of the 97, where the source was known, 28 HCWs found to be injured as follows: (12) with HBsAg positive, (13) with anti-HCV positive and (2) with both HBsAg and anti-HC V positive, in addition to one anti-HIV positive source. Table 5: Serologic testing of HCWs and source patients for HBV, HCV and HIV Infections. 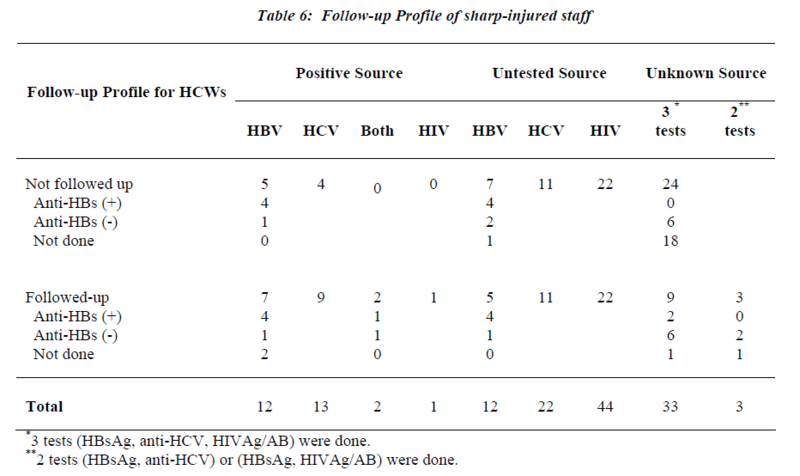 As shown in Table 6, only four of HCWs who were ex-posed to HBV-positive sources were anti-HBs negative or not tested. They had received both post-exposure immu noglobulin and vaccination. No seroconversion to HCV,HBV or HIV infection was recorded among followed-up HCWs. Of the 102 HCWs tested for immunity to hepatitis B, sixty-seven (65.7%) were immune due to either seropositivity for anti-HBs in 46 or both antiHBs and anti-HBc in 21 (Table 7). Twenty-nine (28.4%) of tested HCWs for HB markers were negative. However, twelve of them gave history of vaccination. Table 6: Follow-up profile of sharp injured staff. Table 7: Hepatitis B immune status in the different groups of HCWs. At our institution, our surveillance has shown an increase in the reported cases of NSSIs from 10 injuries in 2001 to 50 during the year 2005. Several factors might be responsible, including the sustained awareness efforts of the Infection Control Department and HCWs understanding the risk of this type of injuries, rather than a real increase in NSSIs. In this review, we reported 133 of HCWs who have been exposed to NSSIs over a period of 5 years with an annual rate of 1% sharp injuries per 100 HCWs. Nurses have been reported to be the major occupational group in our study (45%) which was in accordance with the findings of other studies. [13-26]. This is explained by the fact that nurses are responsible for most of blood sampling and other I.V. access procedure in the hospital; in addition to that, they are more diligent in their reporting behaviors. 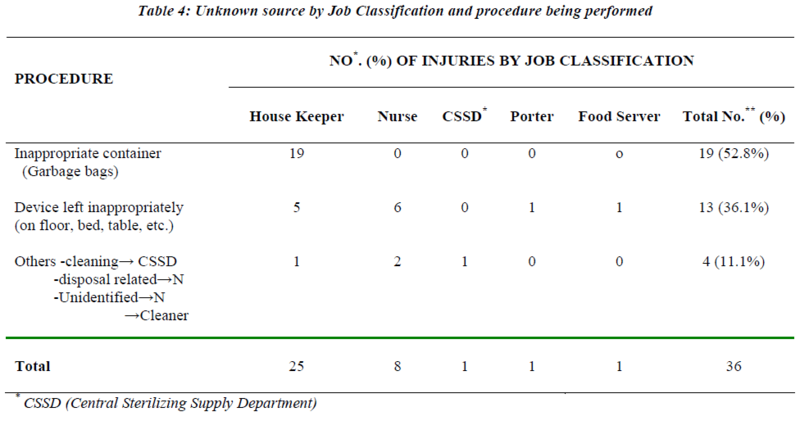 In agreement with many studies, [13-15,17,19,20-25] the other leading job category was medical staff (26%), which it ranked 2nd, after the nurses, this may be explained by self-assessment of their injuries without reporting such incidents. One anomaly in our surveillance was noted, the down-stream staff injuries (housekeeping, catering, CSSD), which ranked third among health care occupations with a percentage of 24.8%, was unexpectedly high. In addition, 25 of 36 unknown source of injuries occurred in housekeepers. These results were surprising because the injured employees were not the original user of the device. However, they are responsible for the disposal of all sharp containers and cleaning rooms, so injuries has resulted during handling these containers, and from devices which were left inappropriately, e.g. needle on bedsheets or floor or put them in inappropriate container like garbage bag, similar finding was documented in other hospitals in Saudi Arabia. [22,25] and other countries [19,14]. Safe handling and disposal of sharps in separate puncture proof containers immediately after use is vital to minimize these injuries. Our result has shown female predominated among HCWs with NSSIs (60%) and that is explained by the fact that the vast majority of nursing staff in our hospital are female in gender. The proportion of sharp injuries pertaining to each clinical specialty differed across various studies [13,15,17-19,21, 22,24,25,27]. These differences could be attributed to the type of sharp devices used and the variations in clinical practices between different healthcare setting. However, in our study and other studies [22,24,25,27], the patient room experienced the largest proportion of overall NSSIs followed by operating room. The emergency room and the medical ward reported 20% for each of the total NSSIs, which is related most probable to rush during patient care and lack of optimum caution during handling sharp devices, especially during patient resuscitation. We found that the highest percentage (55%) of injuries occur during use of a device mainly during blood collection and performing surgical procedure which is similar to experience study done in another part of Saudi Arabia . This emphasizes the importance of teaching program to educate staff at risk to practice high precaution during such handling. The baseline serological data which were reviewed on all 133 HCWs turned to be negative for HBsAg, anti-HCV, and anti-HIV. However, the serology of the source of injuries was known for 97 cases and has shown 12 patients positive for HBsAg, 13 patients positive for anti-HCV, two patients with both HBsAg and anti-HCV positive and one was reactive for anti-HIV. These numbers are alarming and significant as they were more than the prevalence rates of HBV and HCV in the general community in the Kingdom of Saudi Arabia [12,28].The reason is that the sampling of population was heterogenous as the large number of them were inpatients. In contrast to other studies [22,29], despite the high seroprevalence of HBV (14.1%) and HCV (15.5%) infections among tested patients, we observed no seroconversion in any of followed-up HCWs, this may indicate the success of post-exposure prophylaxis program. In addition, HCWs who were exposed to untested or unknown sources and their immune status to HBV were not known, had also received both HBIG and HB vaccine according to ommendation . This study allowed understanding the epidemiology of NSSIs in the target population and identification of the major activities leading to these injuries, which were critical for implementing control measures. Clearly, not every NSSI is preventable, but research has shown that 74% of injuries from needle stick can be prevented . Several suggestions have been made for preventing and limiting sharp injuries among HCWs. These include health education, behavior change (e.g. not recapping needle, disposal related issued), introduction of barriers to protect the caregivers, safer techniques, safer devices (e.g. needleless and self-sheathing equipment), and organization factors such as improved staffing levels and implementing teaching program to educate these downstream staff and safe handling of disposal devices. In addition, accurate post-exposure prophylaxis and follow-up should be encouaged to eliminate or minimize the risk of transmission. 1.Tarantola A, Abiteboul D, Rachline A. Infection risks following accidental exposure to blood or body fluid in health care workers: A review of pathogens transmitted in published cases. Am J Infect Control 2006; 34: 367-375. 2.Cardo DM, Culver DH, Ciesielski CA, et al. A case control study of HIV seroconversion in health care workers after percutaneous exposure. New Engl J Med 1997; 337: 1485-1490. 3.Gazzard BG, Wastell C. HIV and Surgeons. BMJ 1990; 301: 1003-1004. 4.Njoh J, Zimma S. The prevalence of human immunode-ficiency virus among drug-dependent patients in Jed-dah, Saudi Arabia. Subst Abuse Treat 1997; 14: 487-488. 5.Zawawi TH, Abdelaal MA, Mohammed AY, et al. Routine preoperative screening for human immunodeficiency virus in a general hospital, Saudi Arabia. Infect Control Hosp Epidemiol 1997; 18:158-159. 6.Updated US Public Health Service Guidelines for the management of occupational exposure to HBV, HCV, and HIV and recommendations for post-exposure prophyiaxis. Morb Mortal Wkly Rep 2001; 50(RR11):1-42. 7.Al-Faleh F. Hepatitis B infection in Saudi Arabia Clinical Review. Ann Saudi Med 1988; 8: 474-480. 8.Arya SC, Ashraf SJ, Parande CM, et al. Hepatitis B virus in Jizan, Saudi Arabia. J Med Virol 1985; 17:267-274. 9.Parande CM, Arya SC, Ashraf SJ. Hepatitis B virus among Saudi children in Jizan, Saudi Arabia. Infection 1986; 14: 233-235. 10.Al-Faleh FZ, Al-Jefferi M, Ramia S, et al. Seroepide-miology of hepatitis B virus infection in Saudi children 8 years after a mass hepatitis B vaccination program. J Infect 1999; 38: 167-170. 11.El-Hazmi MM. Prevalence of HBV, HCV, HIV-1,2 and HTLV-1/II infections among blood donors in a teaching hospital in the central region of Saudi Arabia. Saudi Med J 2004; 25: 26-33. 12.Shobuukshi O, Serebour F, Al-Drees A, et al. Hepa-titis C virus seroprevalence rate among Saudis. Saudi Med J 2003; 24: S81-S86. 13.Tarantola A, Koumare A, Rachline A, et al. A descrip-tive, retrospective study of 567 accidental blood expo-sures in health care workers in three West African countries. JHosp Infect 2005; 60: 276-282. Shah S, Bonauto D, Silverstein B, Foly M. Worker’s compensation claims for needlestick injuries among health care workers in Washington State, 1996-2000. Infect Control Hosp Epidemiol 2005; 26: 775-781. Jahan S. Epidemiology of needlestick injuries among health care workers in a secondary care hospital in Saudi Arabia. Ann Saudi Med 2005; 25: 233-238. Mehta A, Rodrigues C, Ghag S, et al. Needlestick inju-ries in a tertiary care centre in Mumbai, India. J Hosp Infect 2005; 60: 368-373. Azap A, Ergonul O, Memikoglu K, et al. Occupational exposure to blood and body fluids among health care workers in Ankara, Turkey. Am J Infect Control 2005; 33: 48-52. Al Ghamdi S, Al Azraqi T, Bello C, et al. Needlestick and sharps injuries at Asir Central Hospital, Abha, Saudi Arabia. Ann Saudi Med 2003; 23: 404-407. Gillen M, McNary J, Lewis J, et al. Sharps-related inj-uries in California Healthcare facilities. Pilot study re-sults from sharps injury surveillance registry. Infect Control Hosp Epidemiol 2003; 24: 113-121. Tarantola A, Golliot F, Astagneau P, et al. Occupa-tional blood and body fluids exposures in healthcare workers: Four-year surveillance from the Northern France Network. Am J Infect Control 2003; 31:357-363. Baldo V, Floreani A, Vecchio L, et al. Occupational risk of blood-borne viruses in health care workers: A 5-year surveillance program. Infect Control Hosp Epi-demiol 2002; 23: 325-327. Memish Z, Almuneef M, Dillon J. Epidemiology of needlestick and sharps injuries in a tertiary care center in Saudi Arabia. Am J Infect Control 2002; 30:234-241. Whitby R, McLaws M. Hollow-borne needlestick inju-ries in a tertiary teaching hospital: epidemiology, edu-cation and engineering. MJA 2002; 177: 418-422. Shanks N, Al-Kalai D. Occupation risk of needle stick injuries among health care personnel in Saudi Arabia. J Hosp Inf 1995; 29: 221-226. Abu-Gad HA, Al-Turki KA. Some epidemiological aspects of needle stick injuries among the health care workers: Eastern Province, Saudi Arabia. European J of Epidemiology 2001; 17: 401-407. Kuri-Bulos N, Toukan A, Mahafzah A, et al. Epidemi-ology of needlestick and sharp injuries at a university hospital in a developing country: A 3-year prospective study at the Jordan University Hospital, 1993 through 1995. Am J Infect Control. 1997; 25: 322-329.
h H, Yi S, Choe K. Epidemiological characteristics of occupational blood exposures of health care workers ina university hospital in South Korea for 10 years. J Hosp Infect 2005; 60: 269-275. Ayranci U, Kosgeroglu N. Needlestick and sharp inju-ries among nurses in the health care sector in a city of western Turkey. J Hosp Infect 2004; 58: 216-223. Ozsoy M, Oncul O, Cavuslu S, et al. Seroprevalence of hepatitis B and C among health care workers in Turkey. J Viral Hepatit 2003; 10: 150-156. Panhotra BR, Saxena AK, Al-Hamrani HA, Al-Mulhim A. Compliance to hepatitis B vaccination and subse-quent development of seroprotection among health care workers of a tertiary care center of Saudi Arabia. Am J Infect Control 2005; 33: 144-150. Castello A, Vallino A, Argentero P, Zotti C. Prevent-ability of percutaneous injuries in health care workers: a year-long survey in Italy. J Hosp Infect 2003; 55: 290-294.